As we stepped through the doors, it felt like we were boarding a spaceship. Right next door to JR Akihabara Station is Gundam Cafe, a place for fans of the long-running mecha anime to gather and geek out over their favorite series; a series so influential it spawned the entire chibi aesthetic among other Japanese pop-cultural movements. 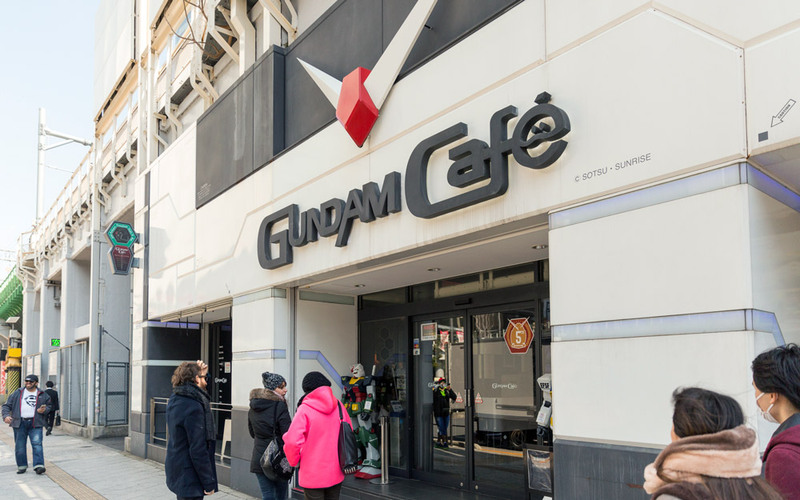 The cafe is easy to spot from a distance because of the Gundam's iconic "V-antenna" sitting above the entrance. The Tofugu Team set this restaurant as our meeting place with the ossan (middle-aged man) we were renting for the day. And so we found ourselves at Akihabara Station early in the morning and walking toward the cafe's entrance, which was flanked by two 1/12 scale Gundam statues. As we stepped through the doors, it felt like we were boarding a spaceship. More accurately, it felt like we were boarding the Earth Federation's White Base, the good guys' ship from the Gundam Universe. Inside was a typical restaurant layout: plenty of tables and bar seating in two places, one facing the window and the other facing the checkout counter. There was a monitor playing Gundam anime so you can relive your favorite moments as you eat robot-themed food. Usually some of the staff are dressed in Gundam cosplay, which pulls you further into the Gundam world. Customers are encouraged to show up in cosplay too! Unfortunately, we got there right as they opened so none of the cosplay staff were working yet. Short for "Gundam plastic models;" model kits for Gundam mobile suits. If you're a Gundam fan, you'll likely spend a lot of time looking around before you sit down. There is a display case featuring a collection of rare Gunpla, the Gundam plastic model kits. The items in this collection are rotated often, so you can come back to see what new robot treasures are on display. Just like the secret Nintendo Cafe 84, superstar signatures are a big part of the decor. There are lots of autographs from Gundam celebs like Tomino Yoshiyuki, the series creator, not to mention tons of voice actors spanning the multiple series. Of course, one of the main reasons to visit a character cafe is to order from the themed menu. 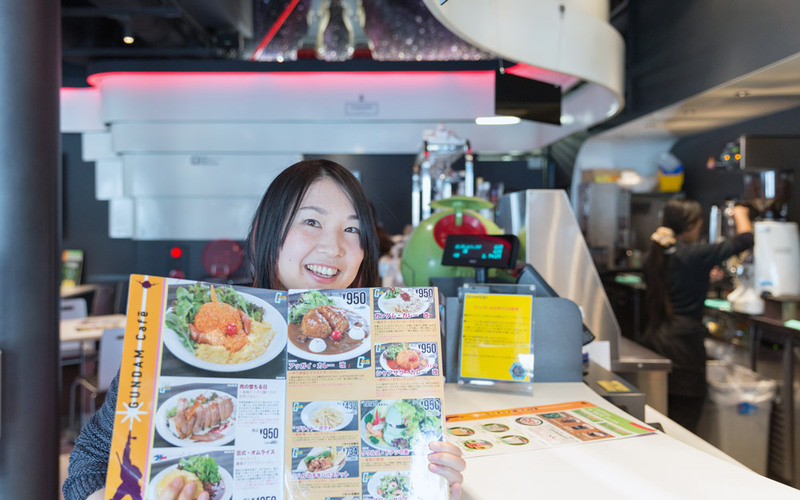 Gundam Cafe's mecha meals look fantastic and they taste… well, they're edible. Clearly, the restaurant is more concerned with presentation than with flavor, though I think the same can be said of most character cafes in Japan. Below are some of the items we ordered during our visit. Be advised, the menu changes frequently, so check the online menu to see what is currently available. Some of the best menu items are the coffee drinks. Each character latte costs ¥464 and there are three flavors: vanilla, caramel, and hazelnut. But the latte's flavor takes a backseat to the foam art fashioned after various Gundam characters. When we visited, there were nineteen designs to choose from and we chose Haro, Char's Zaku, Gundam, and Acguy. The coasters that came with our drinks were super cute too, so I kept one as a souvenir. If you visit Gundam Cafe Akihabara, I definitely recommend the coffee because it has an extra special connection for Gundam fans. You see, they only serve authentic Jaburo Coffee from South America. Die hard fans will know Jaburo as the secret Earth Federation headquarters from the original series. And since the Jaburo base is situated somewhere in the Amazon, the owners of Gundam Cafe called their South American-sourced blend "Jaburo Coffee." If you're not a big coffee fan, Gundam Cafe serves alcohol too, but only at night when they turn on the futuristic blue lights that make the whole place look even more sci-fi. After ordering drinks, we perused the food menu. It was still early morning and we hadn't yet eaten, so we ordered quite a few dishes. 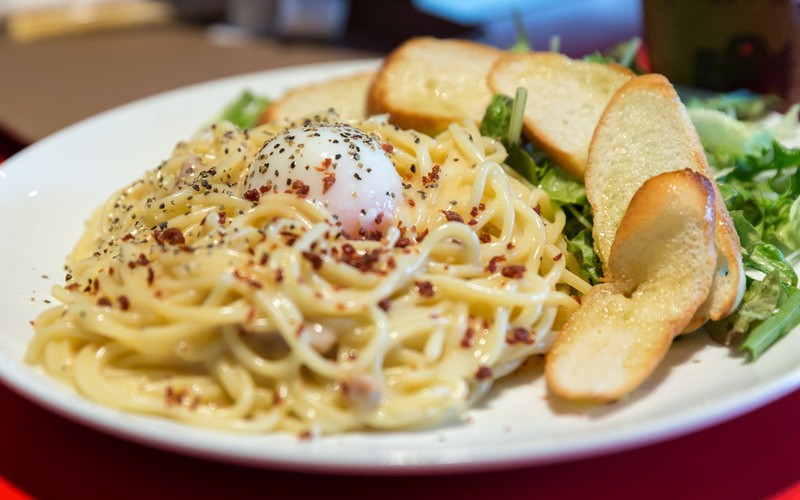 First we ordered the Ninmu Ryoukai 任務了解（） Suicide Bomb Carbonara. 任務了解, which means "mission accepted," were Heero's last words before initiating the self-destruct sequence on his Wing Gundam. This is a lemon-flavored cream pasta. 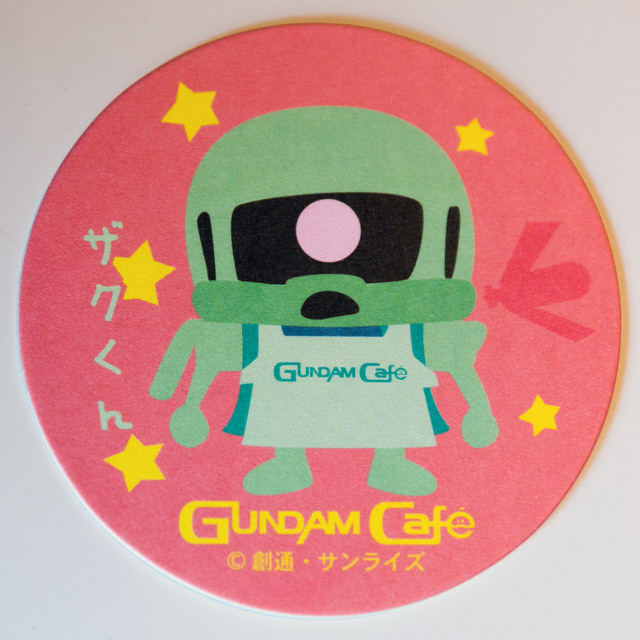 The Gundam Cafe website implies that the egg has something to do with a shooting star. You Gundam Wing fans will have to tell me how all this pasta symbolism connects to that final episode. 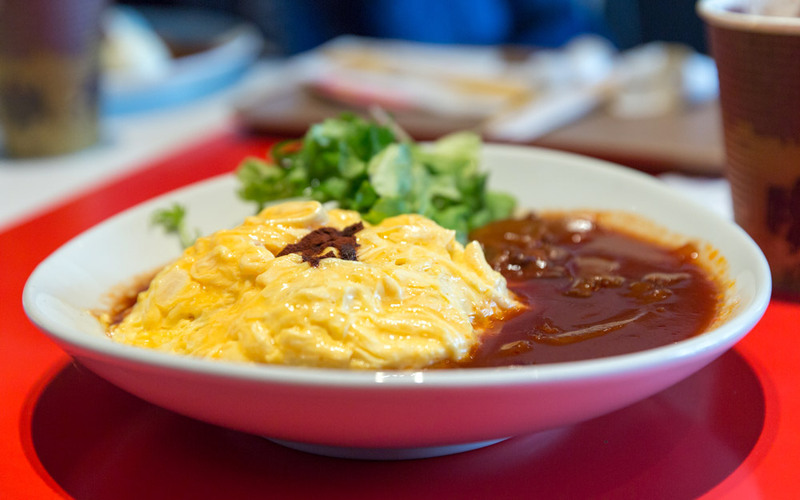 The Hayku Shiki Omurice is based on the Hyaku Shiki Gundam, though I'm not sure exactly what the connection is. This looks like a standard omurice with a demi-glace sauce to me. Gundam fans, can you help me out? Maybe the Hyaku Shiki pilots eat omurice before battle? 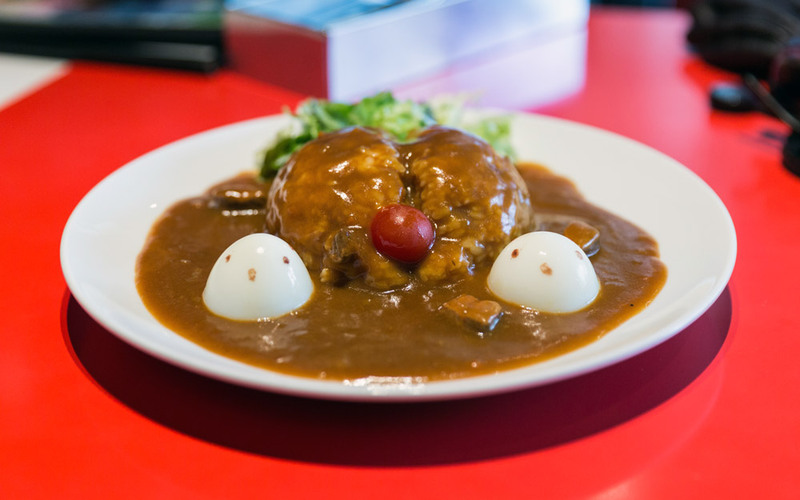 Next, we ordered the Acguy Curry, molded to look like the amphibious mobile suit. If you look at a picture of Acguy, you can see what they're going for. The curry and red tomato look kind of like the head and the two hard-boiled eggs represent its bulbous hands. 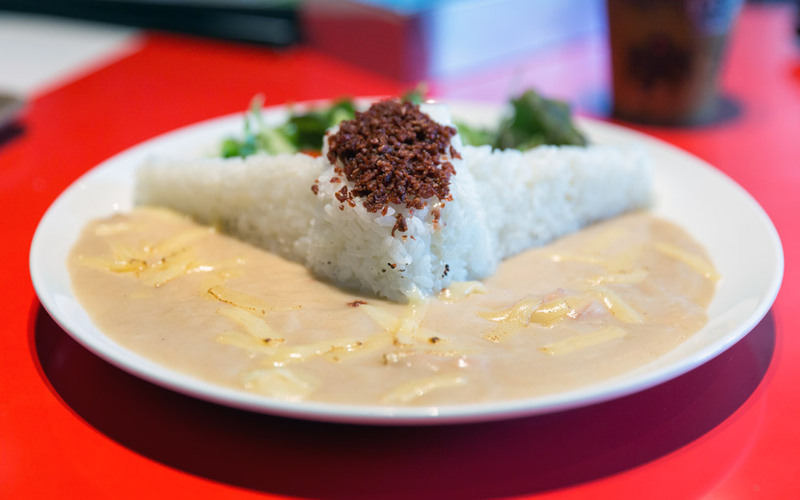 One of the most popular dishes is the Gundam Curry with rice in the shape of the Gundam's famous V-antenna. Below the rice sculpture is a white butter chicken curry and above is a small green salad. For my meal, I ordered Doan's Island based on the episode of the same name. 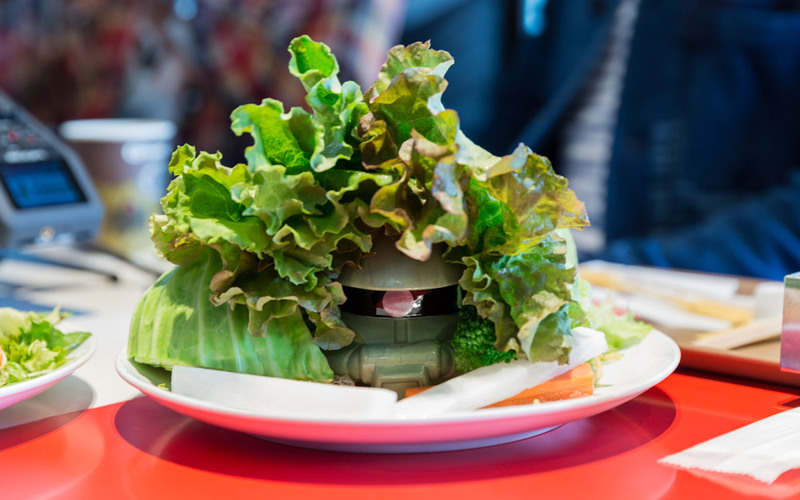 It was basically a Zaku head hiding in a salad forest and a dipping sauce on the side. It looked neat, but it was difficult to eat; I felt like a rabbit nibbling on all that lettuce. 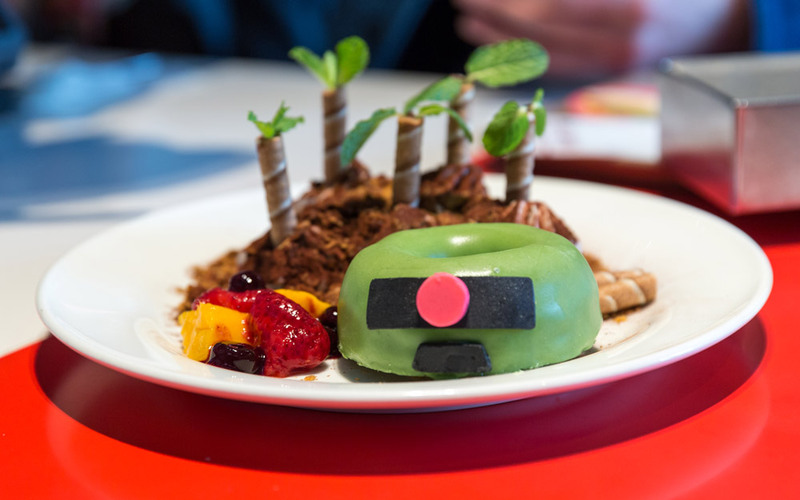 And for dessert, we ordered this very clever Zaku donut. It's no longer on the menu, so just stare at this photo and be happy for us that we got to eat it. Mmmm… it was so tasty. After finishing our meal, we headed to the Gundam Cafe Gift Shop next door. I was impressed by their selection and I think this might be the primary reason fans come to the cafe. The most popular item is the Gunpla-yaki, which is a pastry shaped like the very first 1/144 scale plastic Gundam model released. There are two filling flavors: cream and red bean. There are quite a few other souvenirs worth checking out too, like folders, mugs, flatware, figures and more. Just make sure not to spend all your hard-earned gilla at once (that's the currency in Gundam world, for all you non-otaku). As we left Gundam Cafe Akihabara, we noticed the AKB Cafe was right next door. This place is popular with idol otaku, so if you see a huge crowd nearby, don't get too discouraged. They may be AKB fans clamoring for their idol-themed food. Though the cafe wasn't packed when we visited, we were told it gets crazy busy on weekends and holidays. Try to visit on a weekday if you can. 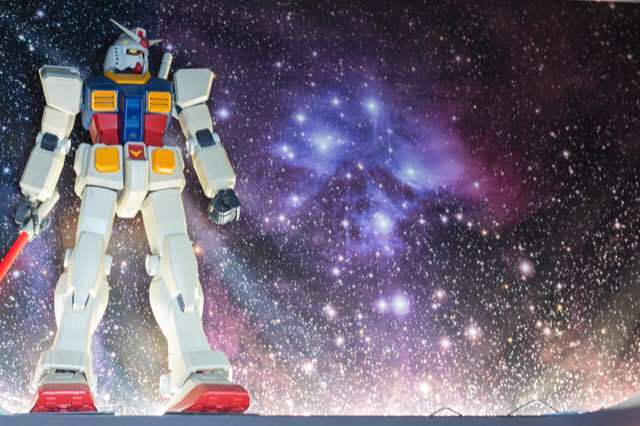 Overall, Gundam Cafe is a great place for Gundam fans to gather and share their fandom. Heck, if you're in Akihabara, chances are you're mildly interested in giant robots, so sipping a latte with mecha foam art may be a nice way to spend an hour of your trip. The toilet was great. I won’t spoil it for you, you can just check it out. Though, honestly I don’t think you should unless you’re a really big Gundam fan. Food and drink didn’t taste that great, so there’s no other reason to come. The bathroom alone bumped my rating up one point. There were two or three large (about four feet tall) Gundam statues hanging about, which was cool. I didn’t expect much from the food or drink going in, and as I expected, they were nothing special. This is worth a visit if you’re a Gundam fan. If not, it’s a hard skip. I love Gundam. The restroom toilet is pretty cool. Just wasn’t in love with the food and drinks, given the price. To be honest, I haven’t watched Gundam before. The themed foods were cute, but they were difficult to eat, and the taste was meh. I wasn’t a big fan of this place, but I bet you’d like it if you are a Gundam fan.